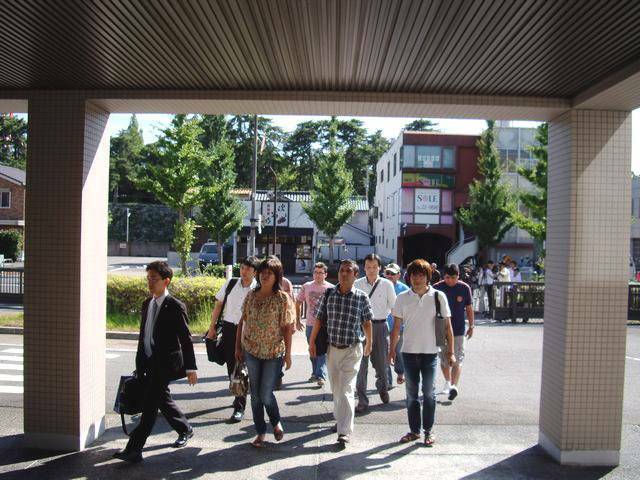 On November 16, a news　program　on　the Asahi　TV　network “Hodo　Station”　made a special 15 minutes program on the death of KIMURA Yuriko, who had　started　to　work　as a newly-hired teacher at an elementary school in Iwata　City, Shiuzoka Prefecture and had　to　kill　herself　five month later. A hostess working in a nightclub in Ginza filed a case to the labor dispute determination committee. She owed money to the club, because customers’ debts were deducted from her wages. She came to the Part-timer, Arbeiter, Freeter & Foreigner Worker Union for labor counseling and spoke up at a press interview;　“I have been working for over six months, but most of my wages are taken as penalty and customers’debts”. The interview can be seen on the Union’s blog. Photo: Attorney　NATSUME Ichiro and FUSE　Eriko, Executive Committee Member of the Part-timer, Arbeiter, Freeter & Foreigner Worker Union at the Press　Club　of　the　Ministry　of　Health,　Labor　and Welfare on November 11. 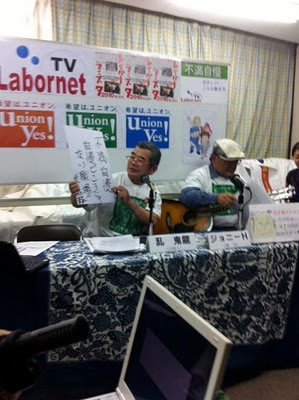 LaborNet TV No.5 was broadcasted on November 16. 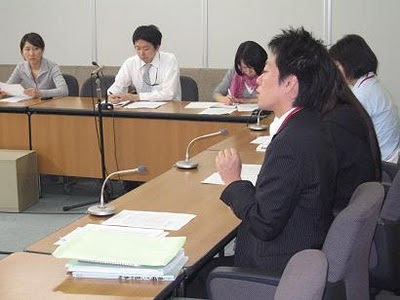 Ｒｉｎａ　Bovｒｉｓse from the Fashion　Ｂｕｓｉｎｅｓｓ Union appeared on its “The Labor Dispute”　corner and gave a testimony on Prada Japan，where she worked as a sales manager before her dismissal. 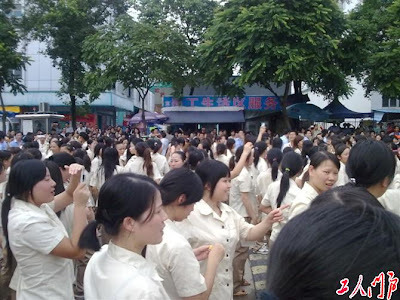 “Woman employees are being demoted on the grounds of ‘age, body shape, teeth alignment, hair style, looks and height’. One women worker with 15 years of service was suddenly demoted and transferred to an outlet shop in Gottanda, whose employees are mainly senior workers. 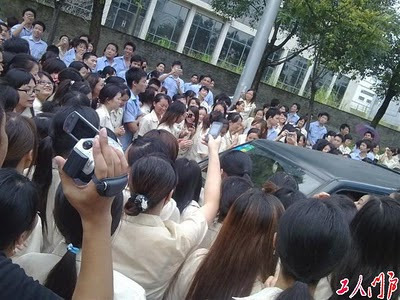 Due to bad sales, employees are forced to buy Prada goods, making their livelihood even harder”. Bovrisse exposed the realities of sexual and power harassment rampant in the fashion industry and urged the worker to raise their voices. 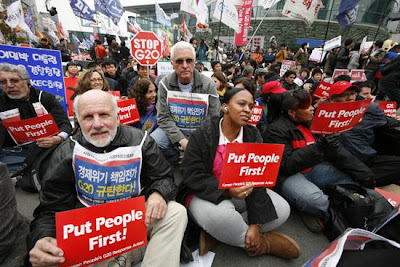 The G20 summit gathered by national leaders around the world started in the evening of November 11, 2010 in Seoul. In protest against the G20 summit, an international rally was held at the square of Seoul Railway Station from 15:00 on the same day. 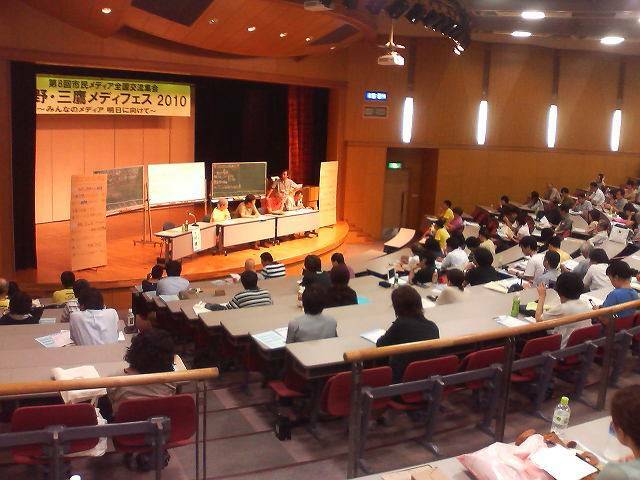 The large gathering, with the title “People first! Down with G20 passing the buck of economic crisis! 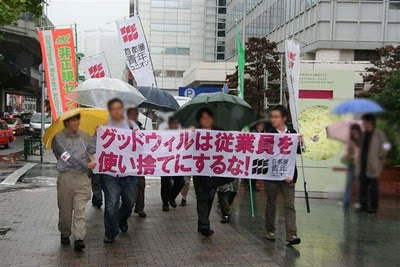 International People’s Joint Action”, strongly sent a message not to pass the buck of the crisis to workers and people. The protest was joined by not only South Korean workers, farmers, urban poor and students but also representatives from the United States, Mexico, Brazil and Japan. 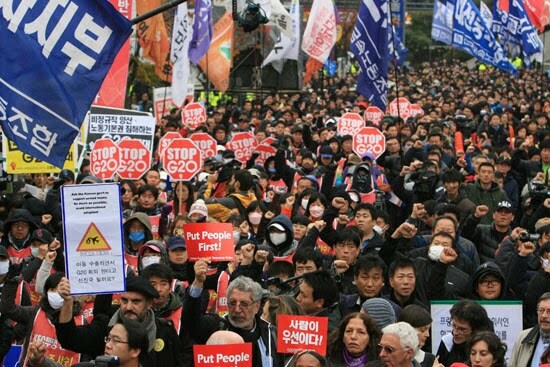 South Korea’s National Industrial Metal Union went on strike for four hours on this day, and the union members from the Gyeonggi and Chungcheong regions participated in the international rally, protesting the G20 summit and demanding the guarantee of basic labor rights. A joint declaration, “Move toward a fair society through solidarity of social movements in the world”, was adopted at the gathering. "Forced to work at the age of 13 with no pay - Still untolerable". 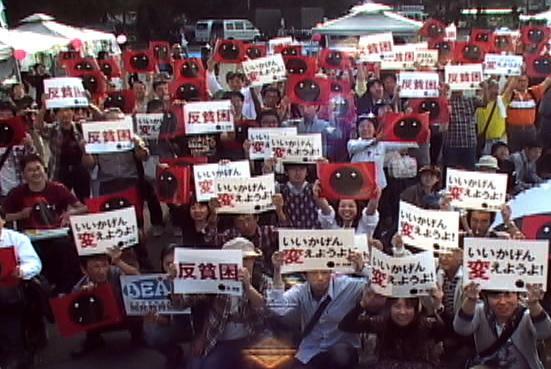 - Harumonis' Sit-in in front of Fujikoshi Headquarters. In the afternoon of October 18, aged Korean women (harumoni) and their supporters conducted a sit-in in front of the Fujikoshi Headquarters in Shiodome area. An 81-year-old Korean woman (photo, left) recalled, "When they forced me to work between 1943 and 1944, I was only 13 years old. Nothing paid. Only harsh memories are left. No word of apologies from them, and no compensation paid. 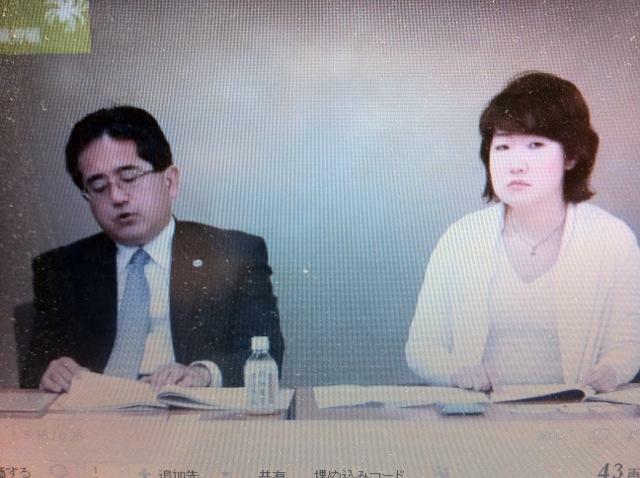 I filed a lawsuit; however, I lost at the High Court in March. I came here to speak with those who are in charge of the case because I don't expect the Supreme Court to reverse the high court's decision. Nevertheless, nobody even takes his or her time to see me. They have no sense of repentance at all. 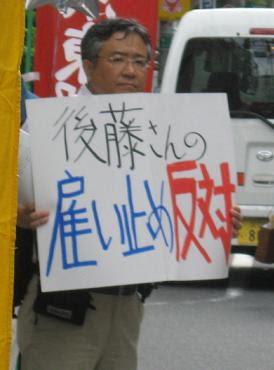 I, however, have made up my mind to continue demanding Fujikoshi apologies even if it takes my grandchildren's generation." 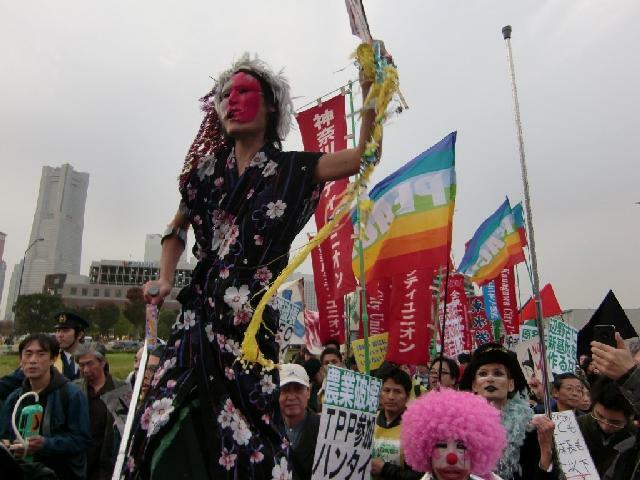 On Saturday, October　16th, 1,200 people participated in the anti-poverty rally at Meiji Park in Tokyo under the clear blue sky. The campaign mainly featured live music and discussions, along with various kinds of booths and group talks on diverse interests. 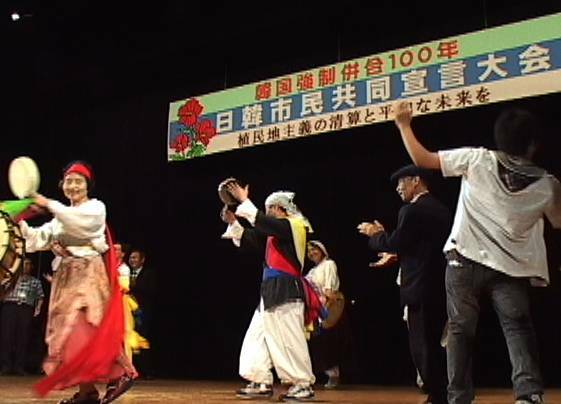 Participants enjoyed the festive mood. 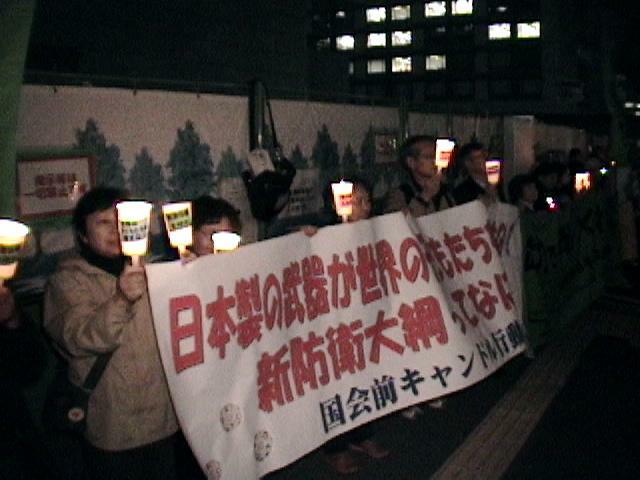 Among all the groups, the one that exposed the brutality of Sumida Ward caught visitors' attention. The ward office has prohibited homeless people from collecting recycle cans to make a few bucks for their food. 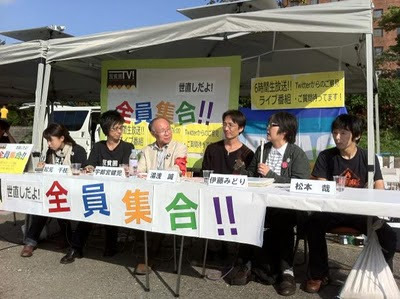 In addition, our first attempt to broadcast the rally with USTREAM (in cooperation with OurPlanet TV and PARC TV) showed segments such as "Tell Me, Mister" and "Anti-Poverty Honest Talk." The program gave an opportunity to the public to think over a number of social issues. 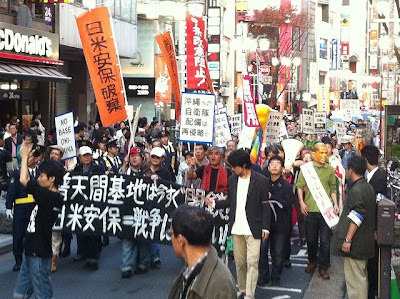 The participants went on to a demonstration after the rally, along with well-known activists, including Karin Amamiya and Hajime Matsumoto, in Tokyo's Harajuku shopping district. 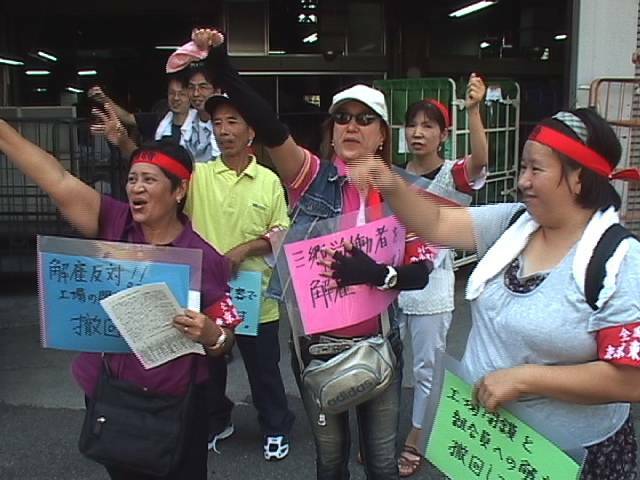 They chanted phrases, such as "The poor are angry!" and "Give us money!" 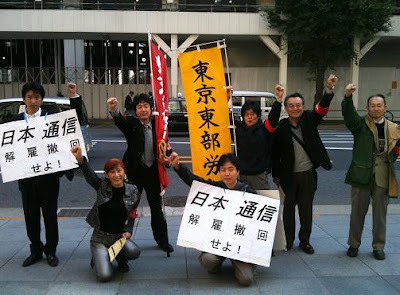 The Tokyo District Court handed down a ruling on Sept. 29 that Hankyu Travel Support (HTS) make overtime payment to its travel agents. 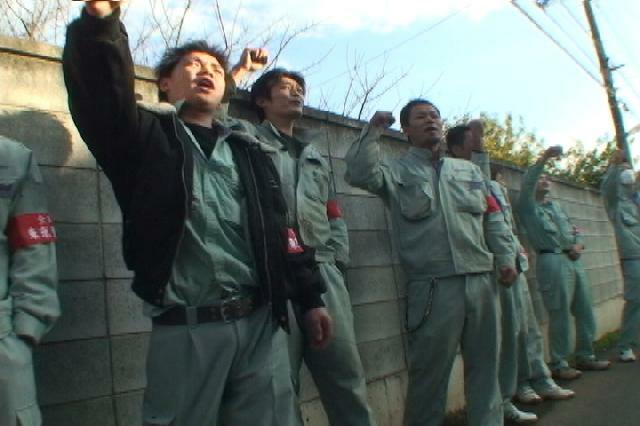 The six plaintiffs, who filed the lawsuit in May 2008, claimed that the company failed to calculate the overtime hours because of the nature of their work and demanded it pay overtime hours for the past two years. HTS claimed that overtime hours were counted in their required work hours and overtime pay in their salary. 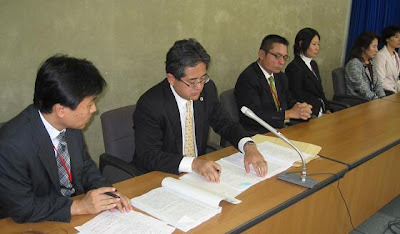 The judge, Kazuhiro Murata, ordered the company pay all six plaintiffs their overtime hours and the same amount of fines as the overtime payment. 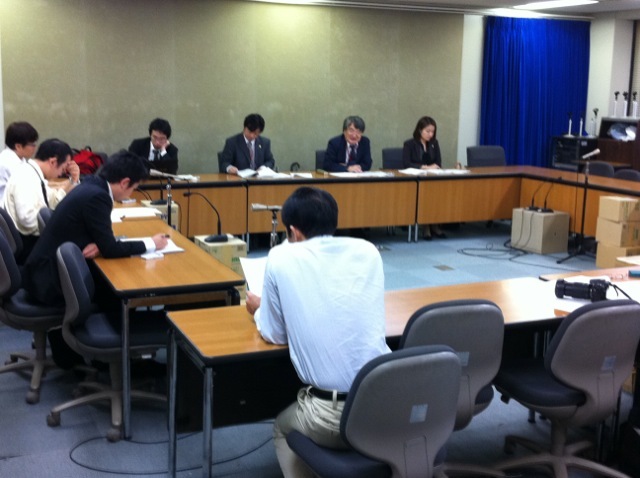 However, the judge approved of the company’s claim that salaries include overtime hours. 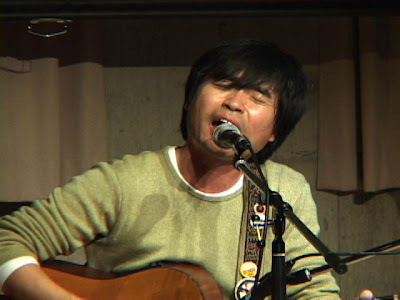 By Sugano of NUGW Tokyo Tobu. Photo: Plaintiffs at the press conference after the verdict. 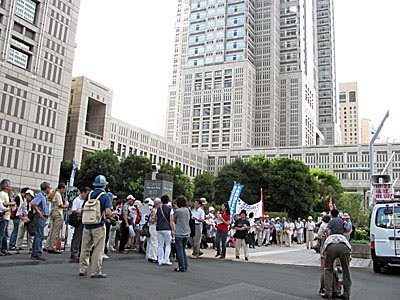 A rally was held in Tokyo on Sept. 26 to protest against the Japanese government’s decision to exclude North Korean schools from the policy to make all high schools free of tuition. Some 1,500 people filled the venue at Shakai Bunka Kaikan. 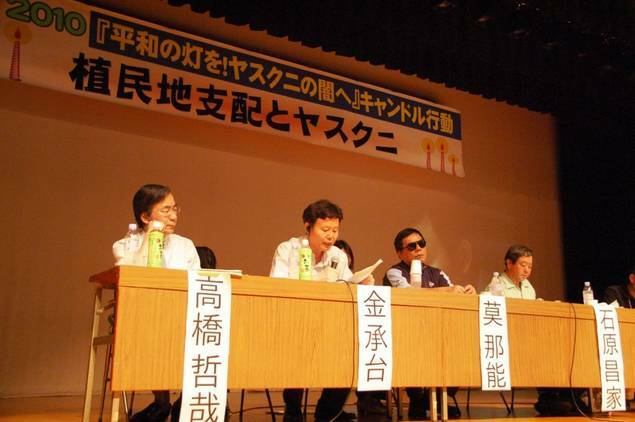 Representatives from nine out of 10 North Korean schools in Japan attended the rally. 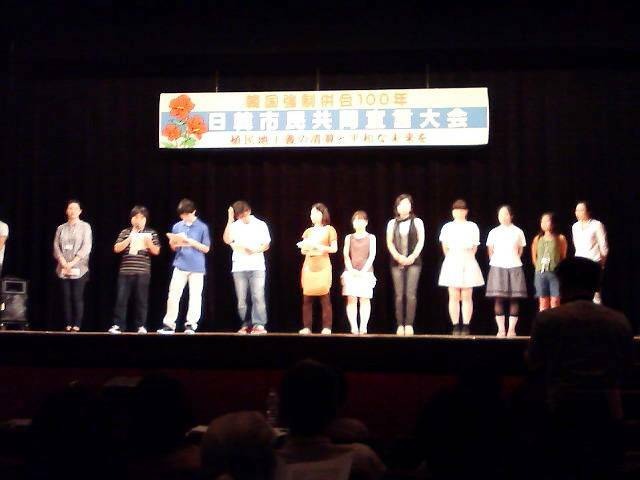 The last one could not attend the rally due to the sports festival. “We had some scary experiences when we received threatening letters and a paper knife. But we love our school. This is the place where our parents were educated and is the place of learning for those of the next generation,” the school official from Kobe North Korean school said in a speech. 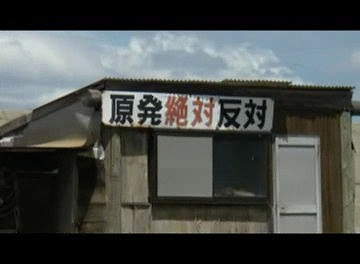 By Masanobu Yumoto. See video on UnionTube. Photo: Participants march after the rally. 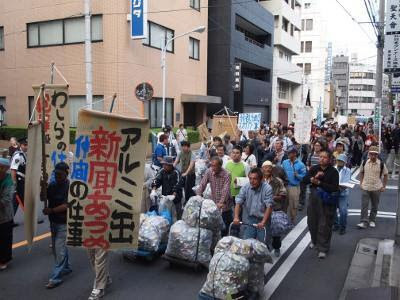 The government order was executed to remove tents and personal belongings of those who refused to obey the government orders to vacate the Miyashita Park in Tokyo’s trendy Shibuya district on Sept. 24. A few hundred riot police and plain-clothed cops filled the park. 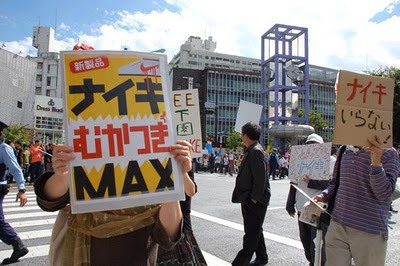 Some 60 citizens who opposed the government’s decision to turn the park into Nike Park conducted a sit-in at the entrance gate from 10 a.m. in an attempt to stop execution of the government order. While the press closely monitored the ordeal, they continued with a protest action. 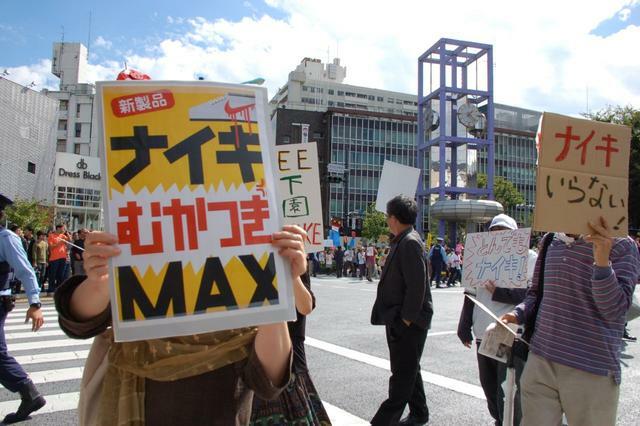 “Is it right to sell people’s park to a private company like Nike?” they made protest speeches in anger against the local government. 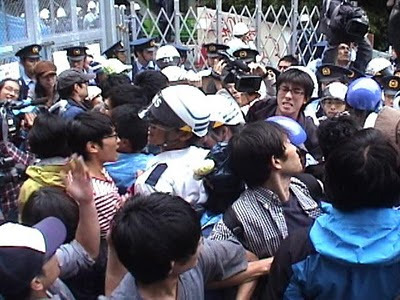 As soon as guards and riot police began forcibly removing the protestors around 2 p.m., the park turned into a chaotic scene (see photo). 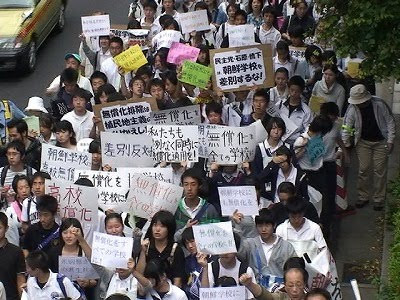 “Stop the brutality,” “We refuse to hand over the park,” the protestors furiously resisted. The government’s order was eventually executed, but the protest at least helped reveal Shibuya Ward’s selling out of people’s park via media reports in and outside of Japan. 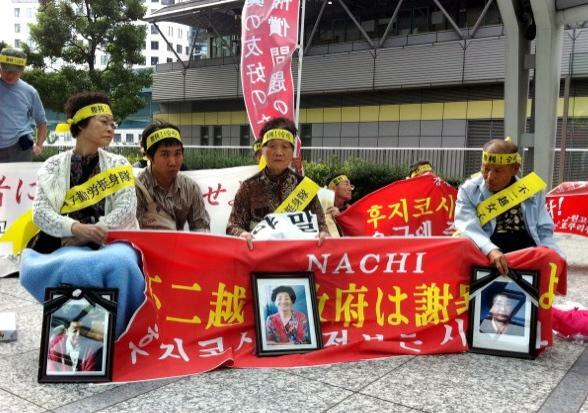 A demonstration was held on Sept. 26 in protest to the government’s brutal and forced action to close Miyashita Park, which participants surrounded in a human chain. The calls to demand the park back to the people echoed throughout the city. By M. See video on UnionTube, YouTube, OurPlanetTV and SoundDemo. 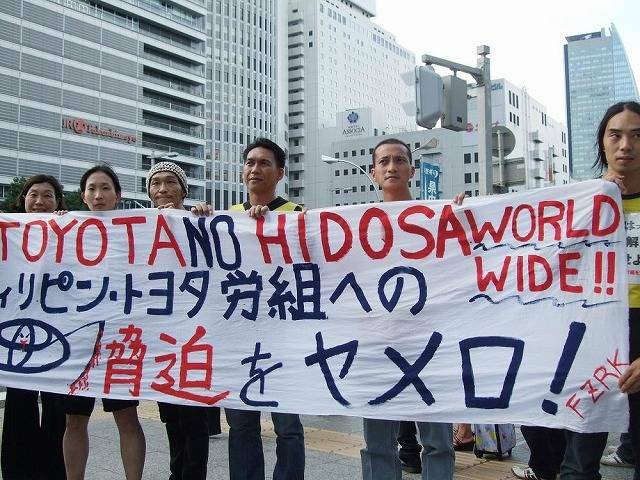 Toyota Motors Philippine Corporation Workers Association President Ed Cubelo and Vice President Wenecito Urgel visited Japan on Sept. 19 to tour Nagoya, Toyoda and other cities in Kanagawa Prefecture and Tokyo for the fifth World Campaign against Toyota. 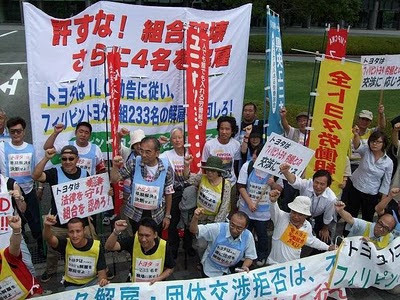 Toyota dismissed four union members including the vice president in March, when ILO handed the Filipino government recommendations to resolve the disputes at an earlier date and the Philippines Department of Labor began arbitration. 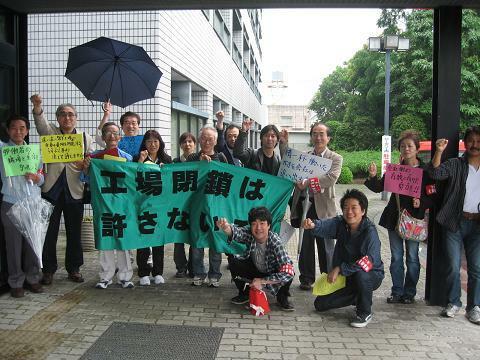 About 70 people from TMPCWA Support Group gathered in front of Toyota’s Tokyo headquarters and submitted a protest letter on the last day of the campaign on Sept. 22. After the solidarity day action, President Cubelo declared at a rally to build international solidarity to fight against Toyota and its neglect of human rights.WEB site of TMCPWA By T.M. The 5th Light the Peace Torch, Light the Darkness of Yasukuni! 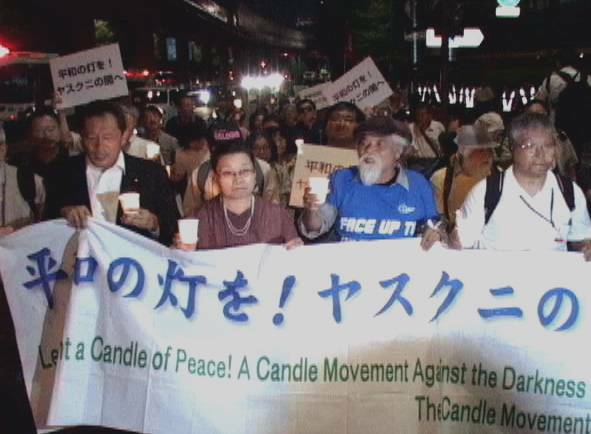 Candle Night Demonstration was held on August 14 at Tokyo’s Shakai Bunka Kaikan Hall, with about 700 people participating. 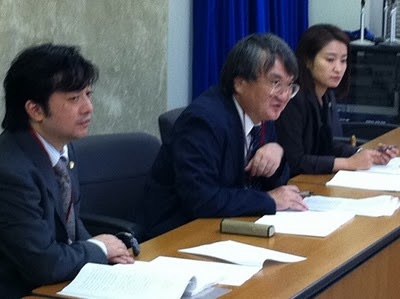 Tokyo University Professor Tetsuya Takahashi criticized that Japanese Prime Minister Naoto Kan only implied South Korea and ignored North Korea in his talk to commemorate the centennial of the Two Koreas during a discussion event on colonial rule and the Yasukuni Shrine. 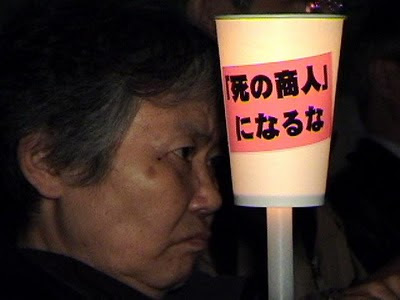 The rally featured music, poem reading, victims’ testimonials and others, followed by a candle-light vigil. The demonstration was disturbed by right-wingers’ propaganda vans but continued shouting, “No War! 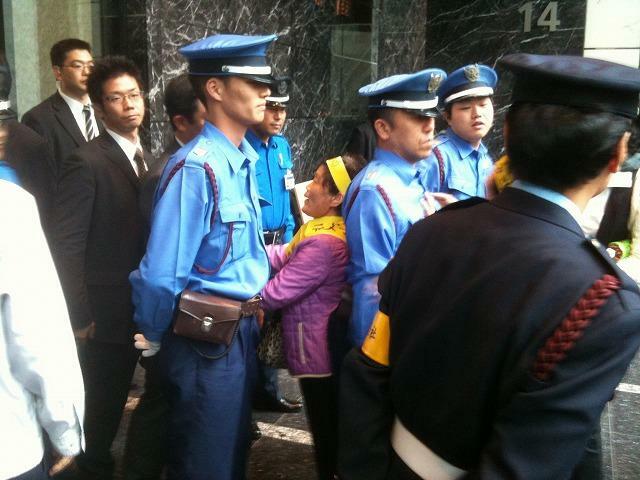 No Yasukuni!” With the police and right-wingers present, the demonstration drew lots of attention from the passersby. (By M) See flash news with photos, view video on YouTube, Mkinbo Photos. 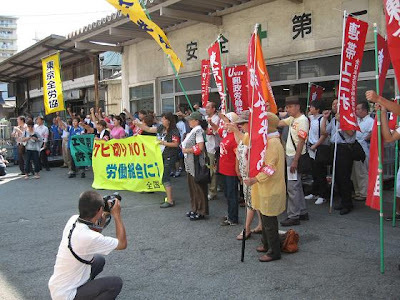 Some 50 people went on a tour to Kaminoseki Nuclear Power Plant on August 5 as a part of 65th anniversary campaign to eradicate A- and H-bomb World Conference. The struggle against Kaminoseki Nuclear Power Plant in Yamaguchi Prefecture continues for 28 years mainly with the people on Iwai Island, about 4 kilometers from the building location of the power plant. The average age of the island population of 500 has reached 70. But they never get tired. They continue surveillance and sit-ins day and night at the building location. The support has spread across Japan, and more than 850,000 signatures were collected for the petition. 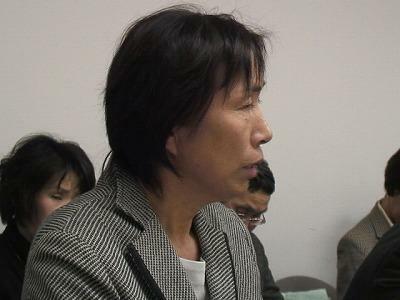 At the reception, Sadao Yamado, a committee chair, reported that there Is an active fault in the building location and the island. 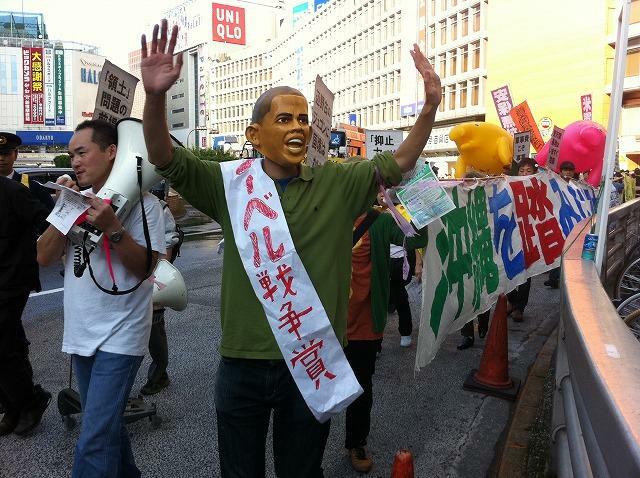 The information is significant for the protest. (By Masanori Yumoto) View video on Union Tube. 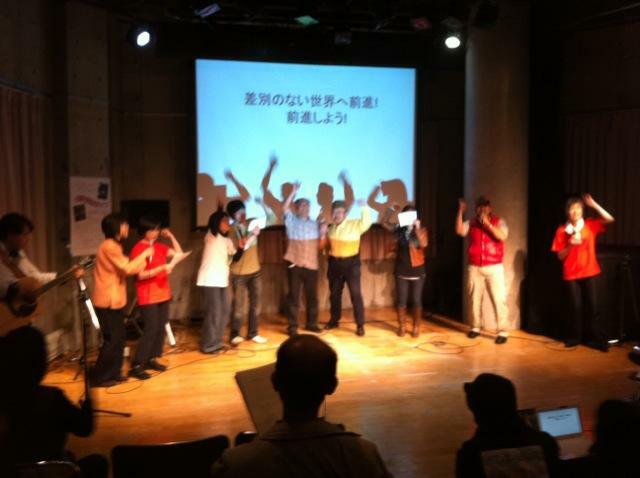 Photo: Tour participants cheer delegation of the building location. 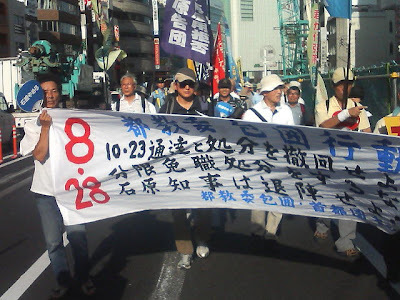 More than a month-long general strike by cement industry in Osaka! The cement industry in Osaka Prefecture has been on a general strike for more than a month by now. 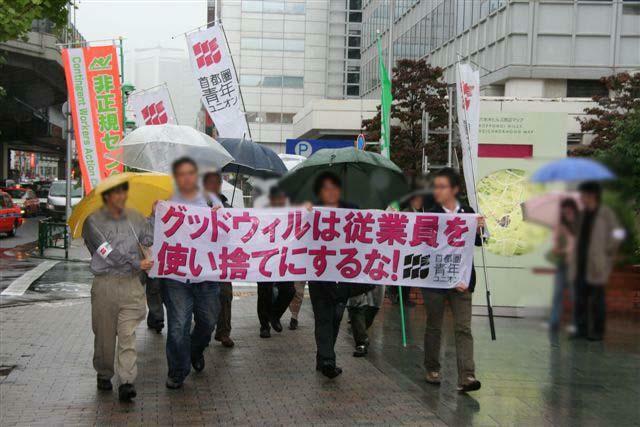 Due to the strike, construction around Osaka Station has been suspended. The strike was launched by about 1,000 owners of small to medium-size companies, and workers and members of cement industry trade union, All Dock Workers Union, Japan Construction and Transport Industry Workers Solidarity Union, and other related unions. 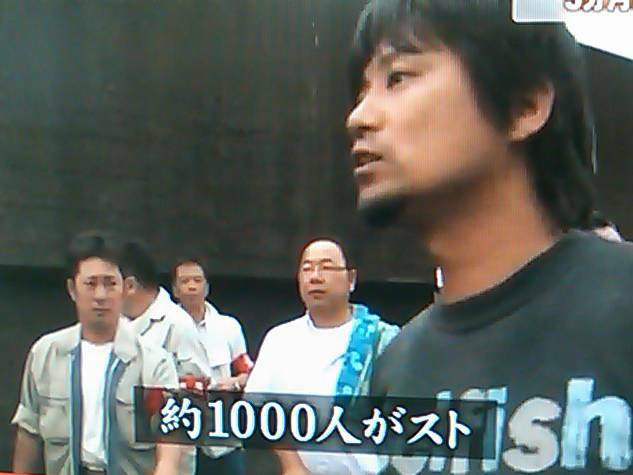 They demanded raising the price of one square meter of cement to 18,000 yen. They launched a strike for an unlimited term. 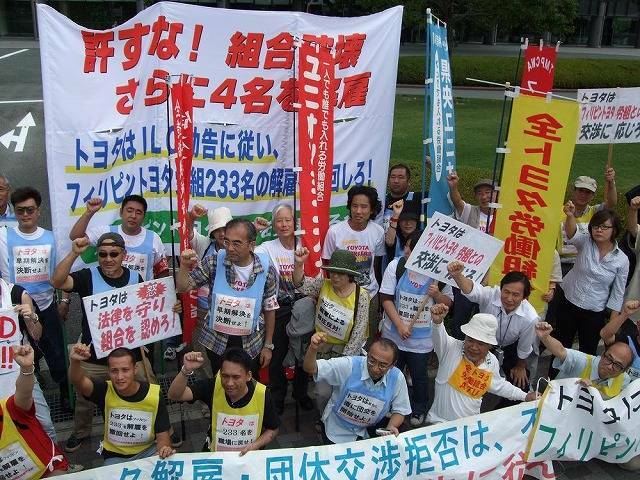 Part of the industry already accepts the new price as appropriate, but a collective bargaining continues with trading companies for cement, workers cooperatives and general contractors. 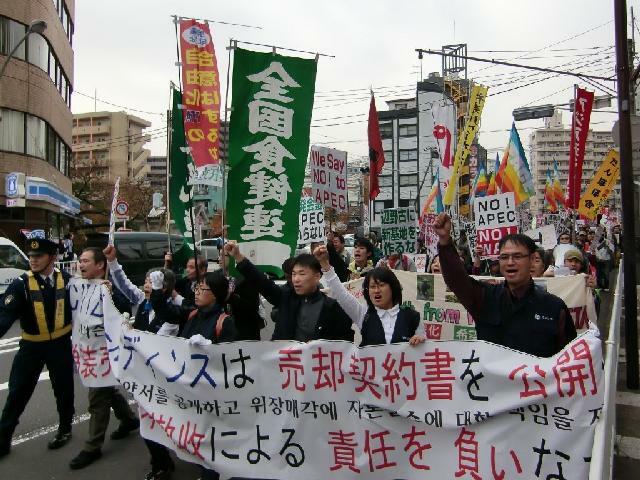 The strike was expected to last for a while. Photo by BS Japan News, Kansai Cement Branch website. 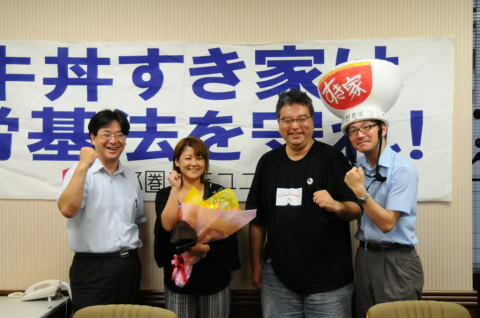 Tokyo Young Contingent Workers' Union: Victory over “Sukiya” at trial and Central Labor Relations Commission!